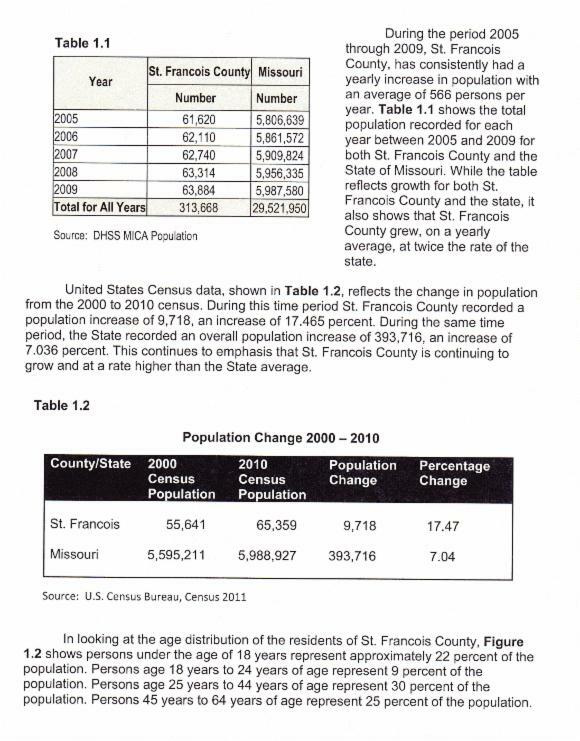 Population and Change:: Over the period from 2000 to 2009, St.Francois County’s population increased by 8.243, going from 55,641 to 63,884. This was a change of 14.8 percent, compared 7.0 percent for the state. Components of Change: Natural increase is defined as births minus deaths. 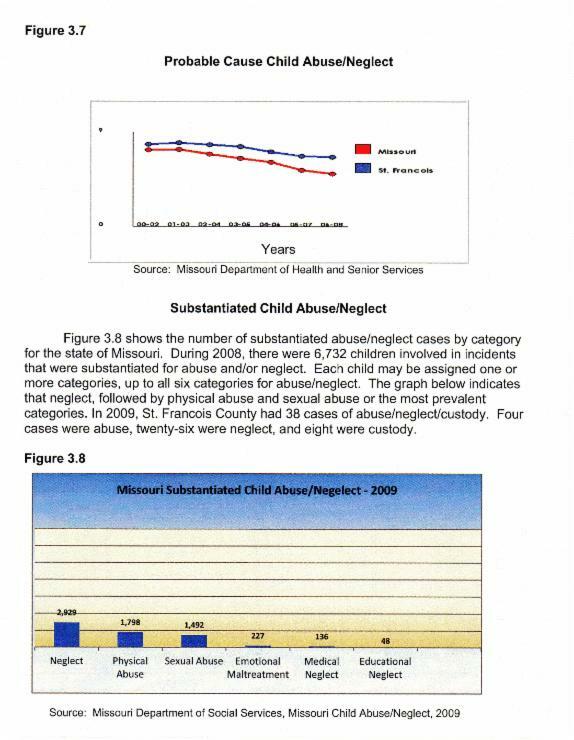 St.Francois County had 701 more births than deaths between 2000 and 2009. Net migration is the difference between the number of people who moved into an area and the number of people who moved out. A negative net migration means a net loss of persons due to migration (more out-movers); while a positive value represents a net gain. 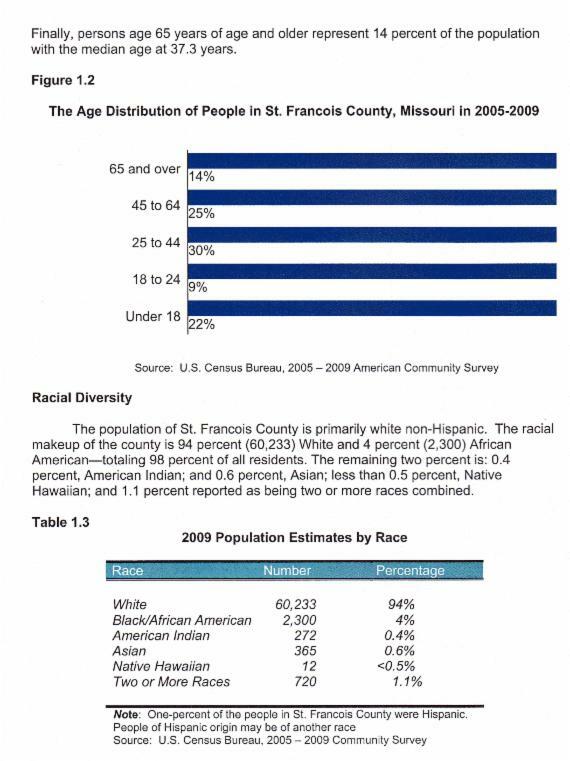 Between 2000 and 2009, St.Francois County had an estimated net migration of 7,542. 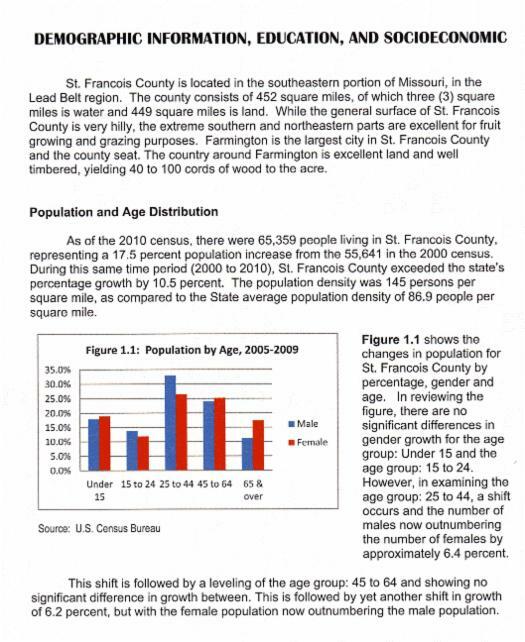 Age: In 2009, an estimated 14.4 percent of St.Francois County residents were 65 and older compared to 13.7 percent statewide. At the same time, the Census Bureau estimated that young people (under 18) made up 22.4 percent of the county’s population, compared to 24.0 percent for the state. Racial Diversity: The 2009 vintage estimates from the Census Bureau indicate that 94.3 percent of the population in the county was White (60,215 persons), while the estimated Black population represented 3.6 percent (2,300) The same set of estimates indicated there were 377 Asians (0.6%) and 272 American Indians (0.4%). These are all “race alone” figures. Hispanic is not considered to be a race by the Census Bureau/OMB, but rather a separate ethnic category. In 2009, an estimated 833 Hispanic persons (1.3%) were living in the county. Place of Residence: Sub-county estimates for 2009 indicate that 58.7% of the county’s population lived in incorporated places of 2,500 or more. Those living in smaller places accounted for 6.0 % of the county’s population. The population which lived in unincorporated areas represented 35.3% of the population. 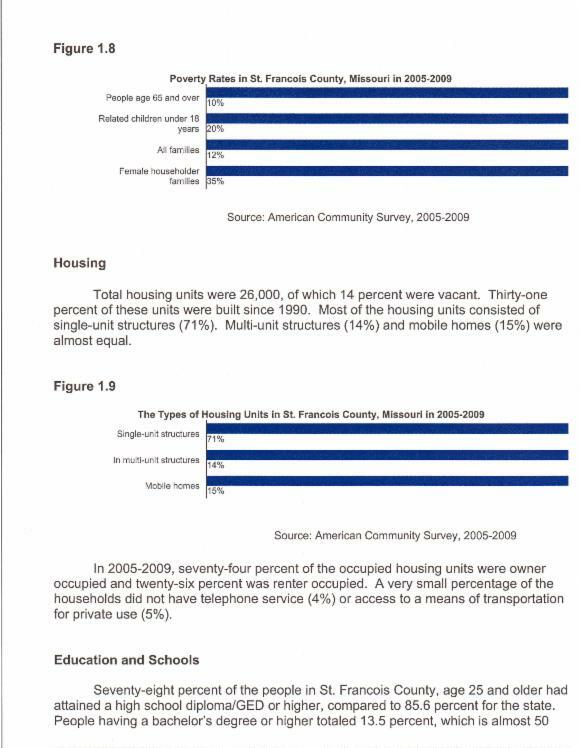 Housing: According to the 2009 Census Bureau’s estimates, there were 26,729 housing units in St.Francois County. The homeownership rate in 2000 was 73.2% compared to 70.3% statewide. In 2000, the median value of owner-occupied housing was $68,200 compared with a statewide figure of $89,9000. Households and Families: There were about 20,788 households in the county according to the 2000 decennial census. 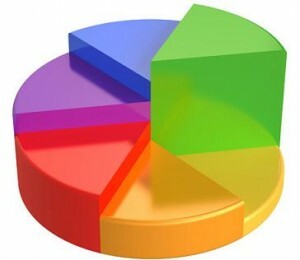 Families comprised 71.3% of the households (14,822). About 23.7% of households were married couples with children under 18, which was more than for the state overall (23.3%) Single parent families accounted for 9.4% of all St.Francois County households, compared to 9.1% for Missouri. 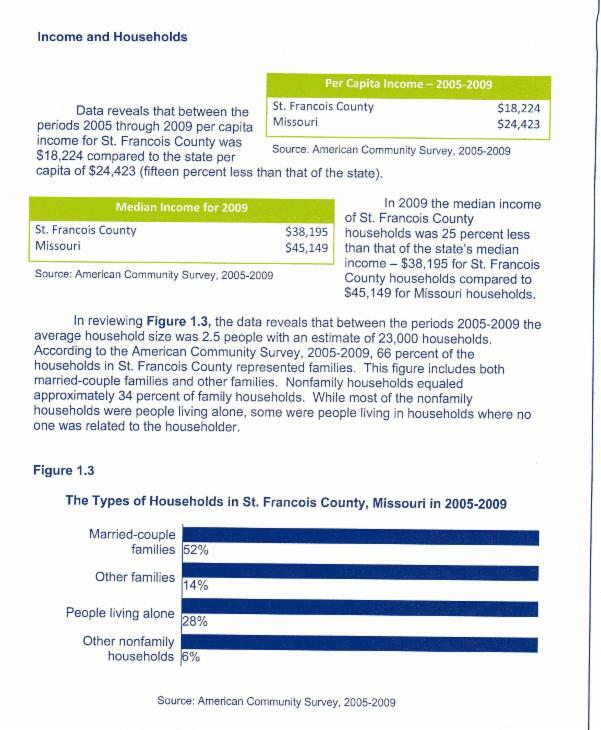 Families and Children: Median family income for St.Francois County was $37,266 in 2009, compared to $46,044 for Missouri. 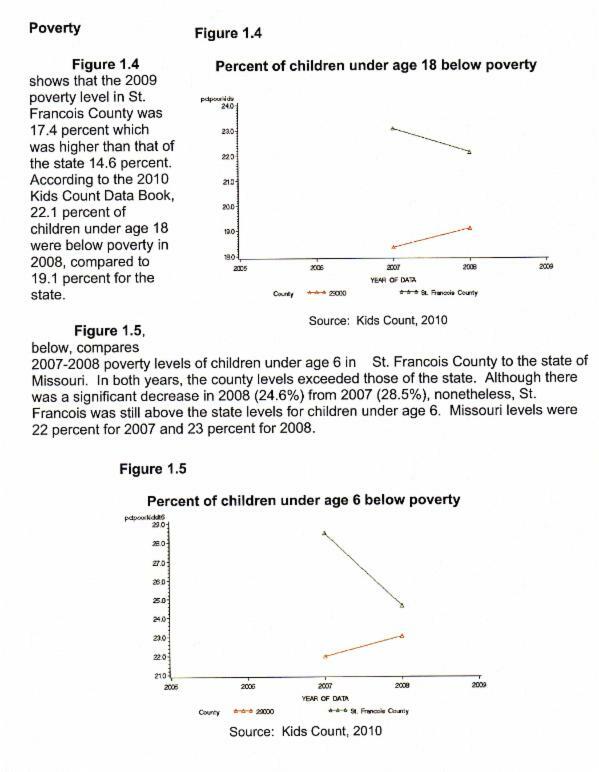 The 2008 poverty rate in St.Francois County was 16.8% which was higher than that of the state (13.5%) The poverty rate among children was 23.1%, which was higher than that of the state, which was 18.9%. 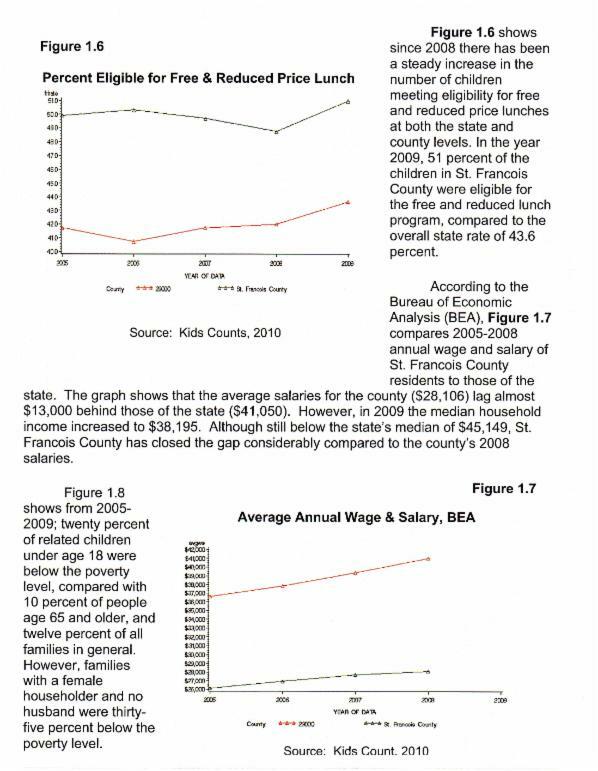 In 2008, 48.7% of the children in St.Francois County were enrolled in the free and reduced lunch program, compared to 42.0% statewide. 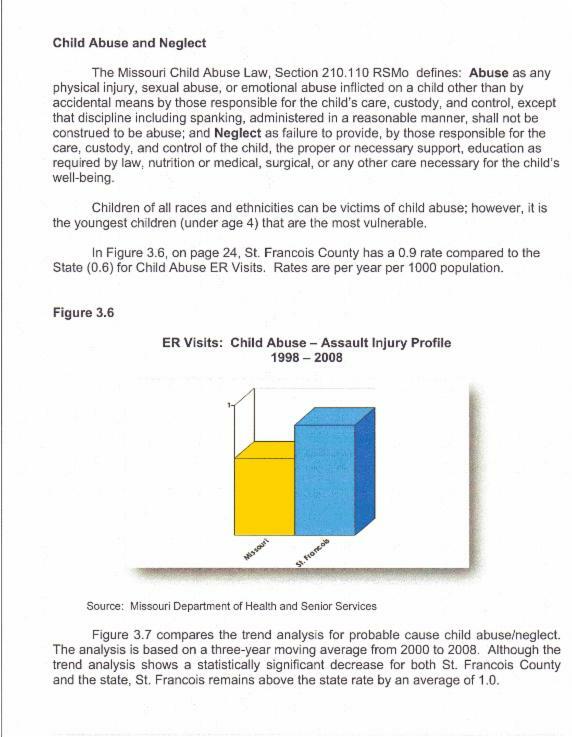 The 2009 annual Kids Count report had St.Francois County ranked 83 out of 114 counties and St.Louis in the state based on an array of child well-being indicators. Kids Count Indicators show that 7.7% of the infants born over the period from 2004 to 2008 were low birth weight infants, while births to teenage mothers were 83.3% per 1,000 girls, compared to 45.4 per 1,00 girls statewide. Unemployment/Jobs by Sector: The 05/2010 unemployment rate (per Bureau of Labor Statistics (BLS), preliminary and not seasonally adjusted, was 10.3%, compared to 8.7% statewide. 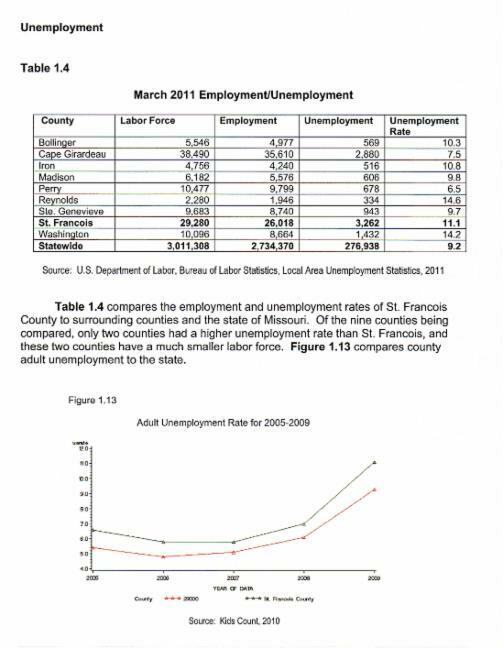 According to Bureau of Economic Analysis (BEA) estimates, in 2008 there were 31,246 jobs in St.Francois County. Health care and social assistance accounted for more than 13.2% of the total jobs (4,137). Retail Trade (3,554), Local government (2,956) and State government (2,869) were the next largest industries for the county. 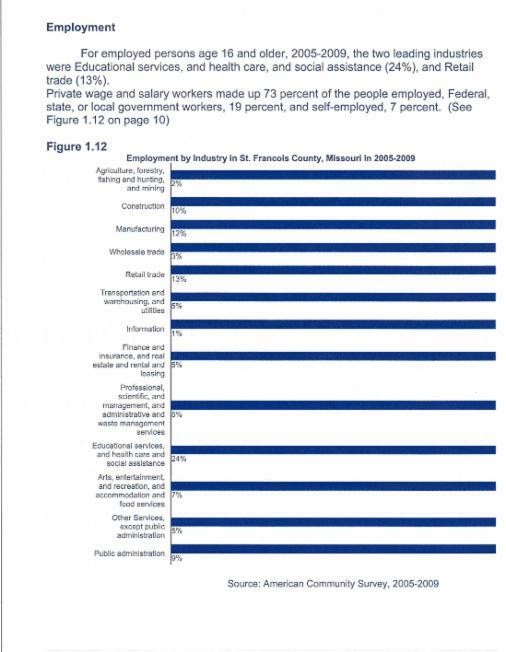 Commuting: In St.Francois County, 27.9% of the workers commuted outside their home to work in 2000. Statewide, 25.2% of workers traveled between 30 to 60 minutes to work, while in St.Francois County, 13.09 traveled as long. At the same time, 16.2% of workers traveled more than 60 minutes to work, compared with 5.4% statewide. Educational Attainment: In 2000, about 10.2% of St.Francois County residents aged 25 years and over (3,810) were college graduates, compared to 21.6% statewide. An additional10,226 had some college education (27.5%) compared with 27.0 % of all Missourians over the age of 25. 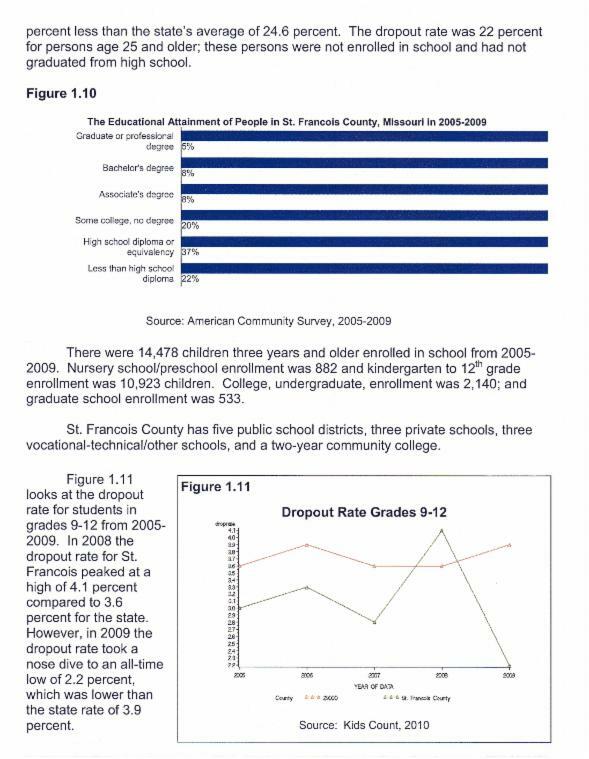 In 2008, the high school graduation rate in St.Francois County was 85.6%, as reported by the Missouri Department of Elementary and Secondary Education. 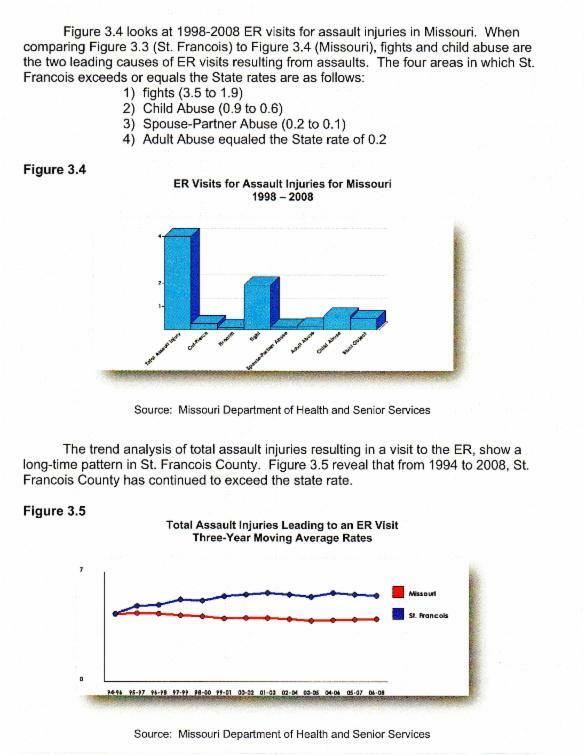 Disabilities: In 2000, 3,655 persons age 65 and older in St.Francois County reported having a disability (47.7%). The corresponding Missouri rate was 42.6%. 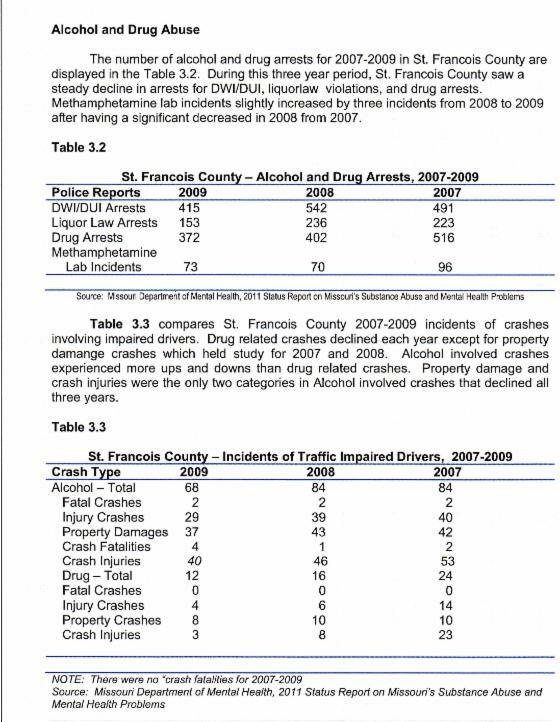 Among the working age population (ages 16 to 64) of St.Francois County, 4,750 reported some work disability, which was 14.5% of all persons in that age cohort, compared to a statewide figure of 10.8%. 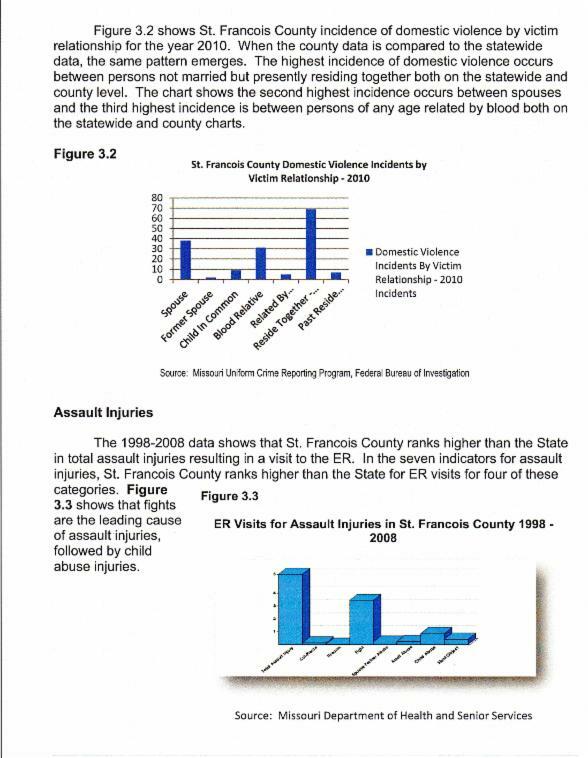 Health Status Indicators: In 2003, over 27.5% of St.Francois County residents reported their health was fair or poor compared with 16.9% statewide. While 12.3% of Missourians reported having no health coverage, the percent without health coverage in St,.Francois County was estimated at 17.4%. State health data reported the top two prevalence indicators for the county were Current Smoker (26.5%) and High Cholesterol (35 years and older) (41.8%). 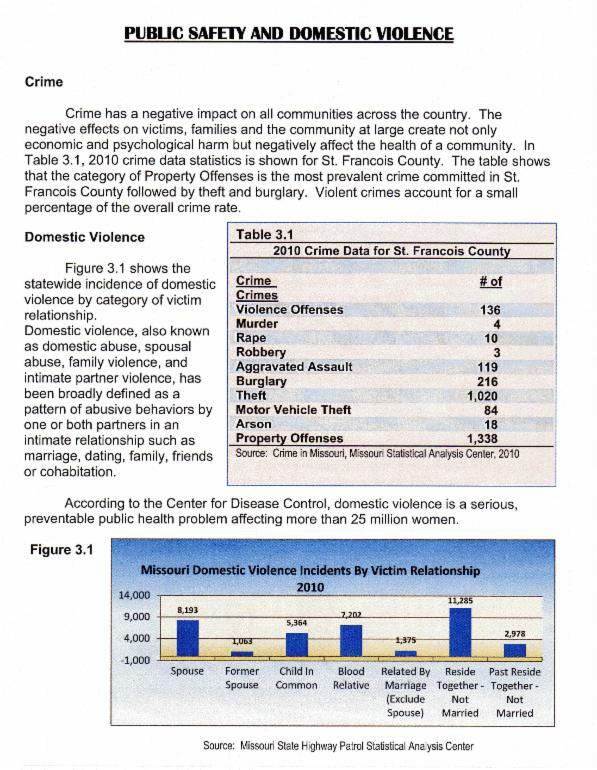 Missouri reported 26.5% and 37.3% in those categories. Age-adjusted Mortality: The age-adjusted cause-of-mortality rates (per 100,000 persons) was significantly higher than the state for St.Francois County; Heart Disease(338) and Lung Cancer (81.0). The corresponding Missouri rates were 298 and 64.3, respectively.